Also in the factory: Gluten, Eggs & Nuts. 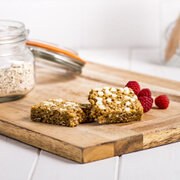 An Exante Diet bar like no other! 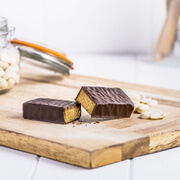 ‘Nutrageous’ peanut flavour smothered in delicious chocolate. Perfect for when you’re out and about, it will drive you nuts! Use in conjunction with food as a Meal Replacement for weight control or use 3 products per day alone (as directed) as a Total Diet Replacement for weight control. It is recommended that Total Dietary Replacement is not followed for more than 3 weeks without seeking medical advice. Not suitable for pregnant or breastfeeding women and those under the age of 18. Maintain an adequate fluid intake. It’s important that products are used as directed and that you maintain an adequate daily fluid intake. For best results add 20 minutes of exercise daily! 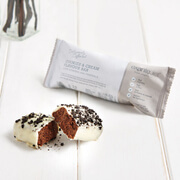 Protein Blend (Soya Protein Isolate (Soya), Hydrolysed Whey Protein Isolate (Milk), Milk Protein Isolate (Milk), Whey Protein Concentrate (Milk), Emulsifier (Soya Lecithin (Soya)), Fructo-Oligosaccharides, Humectant (Glycerol), Dark Chocolate Couverture (13%) (Sugar, Cocoa Mass, Cocoa Butter, Emulsifier (Soya Lecithin) (Soya), Flavouring), Water, Glucose Syrup, Peanut Flour (Peanut), Sunflower Oil, Di-Potassium Phosphate, Flavourings (Peanut), Di-Magnesium Phosphate, Sodium Chloride, Tri-Calcium Phosphate, Vitamin & Mineral Blend (Sodium Ascorbate, Ferric Pyrophosphate, Vitamin E, Nicotinamide, Zinc Oxide, Vitamin A Acetate, Calcium D-Pantothenate, Sodium Fluoride, Manganese Sulphate Monohydrate, Vitamin B12, D-Biotin, Chromium Chloride, Potassium Iodide, Vitamin D3, Folic Acid, Sodium Selenite, Copper Citrate, Pyridoxine Hydrochloride, Thiamine Hydrochloride, Vitamin K1, Riboflavin, Sodium Molybdate), Sodium Bicarbonate, Trucal (Milk Mineral Complex) (Milk), Ascorbic Acid, Sweetener (Sucralose), Vitamin B6, Antioxidant (Mixed Tocopherols).